The Singapore housing market is attracting a new surge of foreign buyers, following a brief decline that resulted from the Additional Buyer’s Stamp Duty (ABSD) imposed in December of last year and the discontinuation of the Financial Investor Scheme in late April this year. According to a recent report published in The Business Times, Malaysian investors comprised the largest percentage of foreign buyers in Q2 2012, accounting for at least 6.3% of foreign purchases. Other major investors include Indonesians (4.7%), Mainland Chinese (4.4%), and Indian nationals (3.0%). In general, there was an overall boost in private non-landed residential property investments in the second quarter of this year. A total of 8,311 transactions (including purchases by Singaporeans) were recorded in Q2 2012, marking a 37.2% increase from 6,059 transactions in Q1 this year. Of these transactions, foreign purchases comprised almost 23% in Q1 and 23.6% in Q2 this year. Aggregate data from July to August shows a 27.1% increase in foreign buyers. Analysis by Rikvin, a Singapore Company Registration specialist, indicates that the market for foreign investors has stabilized in spite of the introduction of the Additional Buyer’s Stamp Duty, which imposes a 10% tax on foreigners buying private property on top of existing Buyer’s Stamp Duty (BSD). In addition, the Financial Investor Scheme (FIS) was dropped with effect of April 2012, leaving the GIP (Global Investor Program) as the primary route through which HNWIs can earn Singapore permanent residency and purchase property in Singapore. The FIS was scrapped to cool the heated property market, which was partly contributed by the rapid influx of foreign HNWIs bulk buying local property. “Current trends signify a return of foreign demand for Singapore housing in spite of stricter measures imposed on foreign buyers,” observed Mr. Satish Bakhda, General Manager and Head of Rikvin’s Operations. “It can be recalled that the introduction of the ABSD and the scrapping of the FIS were intended to promote a more sustainable residential property market. In gist, there was a need to control prices in the face of strong investor demand and relative market saturation,” Mr. Bakhda explained. 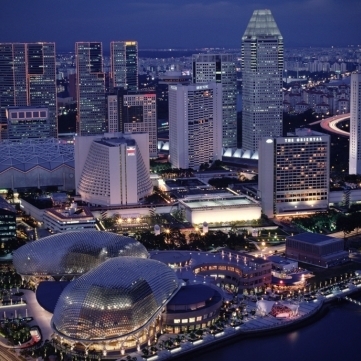 “The recent increase in foreign demand, however, shows that Singapore remains to be a prime location. Clearly, more investors recognize the profitability of steadily appreciating values and the overall potential of the Singapore property market. In addition, Singapore continues to boost its reputation as an ideal base for entrepreneurs seeking Singapore company formation, gold collar professionals on the Personalized employment pass program, and investors ready to capitalize on the city-state’s bustling economy,” he concluded.